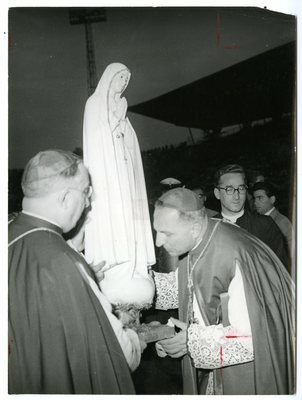 "Fatima Statue at Flaminiam Stadium"
Bishop Luigi Traglia, Vicegerent of the Vicariate of Rome, pays homage to Our Lady of Fatima at the Flaminian Stadium in Rome, September 14, 1959. Bishop Ettore Cunial, Second Vicegerent of Rome, stands by the statue. Originally appeared in the Marianist Magazine.